A few weeks ago I had a day off from work in the middle of the week. Aren't those the best kind of days? Everyone else I knew was at work but my baby brother. Side Note: baby brothers are the best. His semester of school hadn't started (oh I miss those days of long summer breaks) so we decided to spend the day together. I love horror movies but they terrify me. Watching them during the day helps but I still cannot watch them alone. Almost everyone I know refuses to watch them, including Jessica, but my brother has always been up for watching them with me. Since my brother was being a good sport and not only hanging out with his big sister but also letting me pick the movies I wanted to make him something he would love to eat. 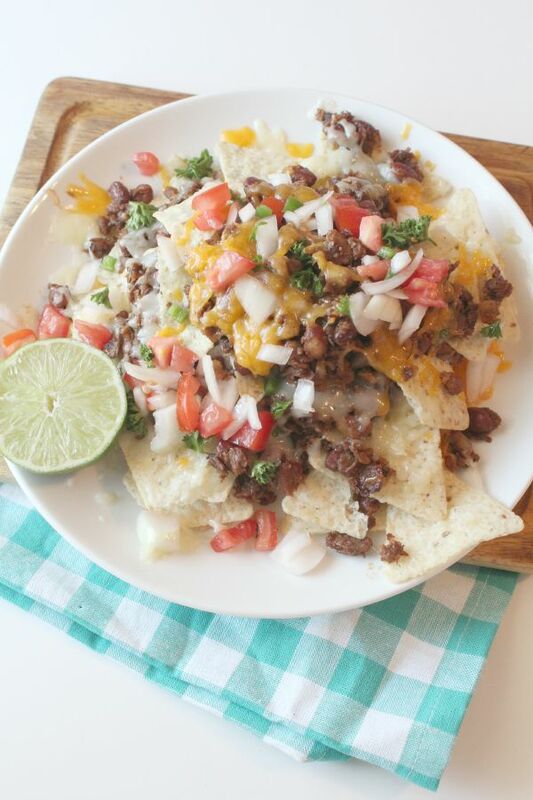 These loaded nachos were super easy to make and my meat loving brother did not even care that I substituted veggie crumble in the place of the beef. I felt like this recipe made enough to feed a small army but brother obviously saw it differently. I loved the touch of tang from the lime and how the pico de gallo freshened up these nachos. 1. In a skillet over medium-high heat, add the olive oil and half the onion. Cook it until starting to soften, then add the ground beef (or you can substitute vegetable crumble like I did). 2. Cook the meat until it's totally browned, then drain the fat. Add the chili powder, paprika, crushed red pepper, salt, and pepper and stir to combine. 3. Add the beans and hot water and stir. Reduce the heat to low and simmer while you prepare the other ingredients. 4. To make the pico de gallo, combine the other half of the onion with the tomato, jalapeno, cilantro, lime juice, and 1/2 teaspoon salt. Stir it together and set it aside. 5. 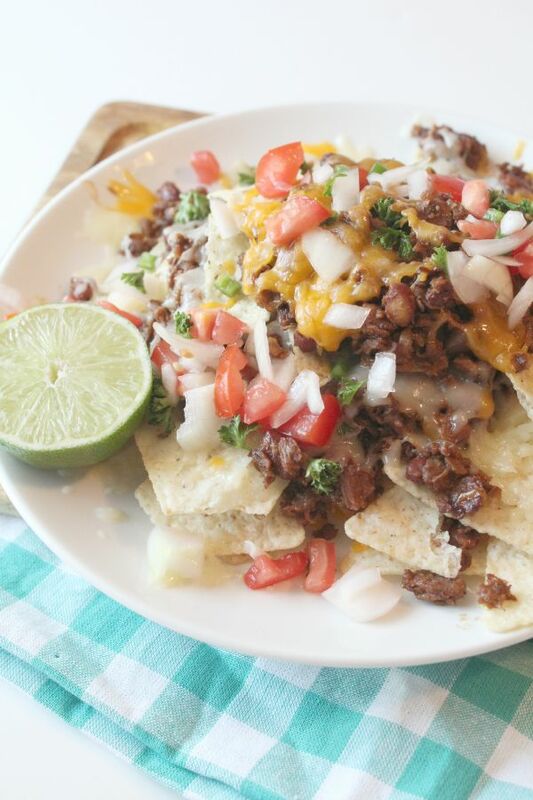 To build the nachos, place a layer of tortilla chips on a platter or plate. Top with a layer of the beef/bean mixture, then all but 1/4 cup of the cheddar cheese. Add another layer of chips, another layer of the beef/bean mixture, and the Monterey Jack cheese. 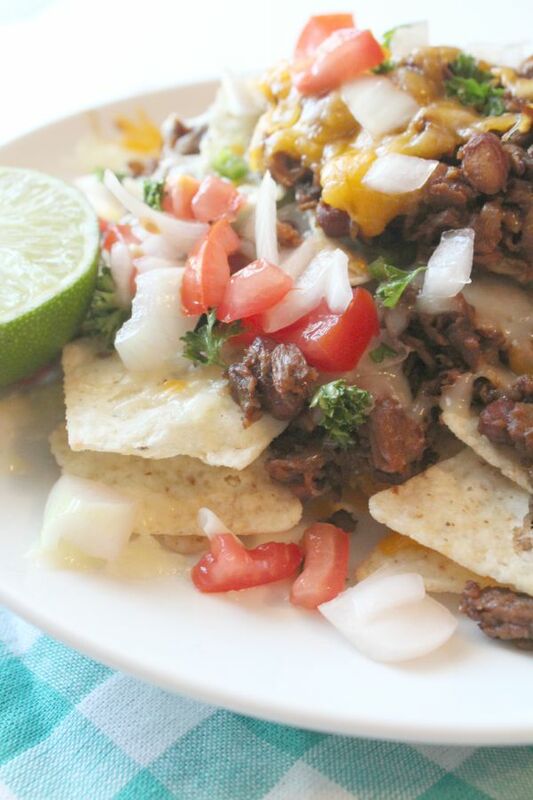 Add a final small layer of chips, then a small layer of beef and beans, then a final sprinkling of cheddar. What a super delicious recipe!